FOR YEARS IT was an institution. The Dubs called it ‘Culchie Shopping Day’ and it meant trains and buses of eager shoppers from all over the country would be arriving in the city to spend their money. Now things have changed. Fewer schools are closed for Feast of the Immaculate Conception and what used to be the shopping day is now like any other. Retailers say Black Friday has now taken over from 8 December as it increases in popularity every year. 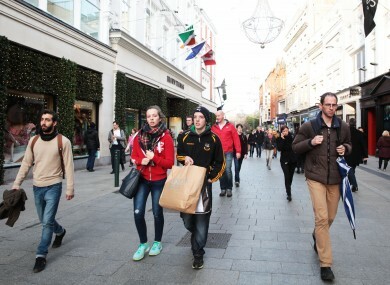 Richard Guiney, CEO of Dublin Town, said 85% of shoppers over the course of the year in the city have Dublin addresses. Just 10% are from the rest of the country and this remains relatively consistent throughout the year – even on 8 December. “Black Friday would be significantly bigger now. This year we had footfall of almost 550,000 in the city which was quite large and last year it was 560,000. The busiest days now are the two Saturdays before Christmas when we generally have 600,000 people on both days,” he said. Thomas Burke, director of Retail Ireland, said the growing popularity of Black Friday means the Christmas shopping period kicks off much earlier. “People are now a bit more focused on Christmas earlier than they would have been and they spread out the shopping over a longer period,” he said. A number of other factors come into play in the decline of Culchie Shopping Day. Though some schools still close, it is not a nationwide tradition anymore. There has also been a major increase in shopping options outside of the capital, Guiney explained. Now shopping centres in other areas of the country have better offerings than they used to. Online shopping, of course, has also played its part and this is something Irish retailers need to get in on. “That’s the least developed of the channels for Irish retailers,” Burke said. However, as we move closer to Christmas, people are more likely to get themselves into a ‘bricks and mortar’ shop than to go online. Though 8 December may have lost its status as the country’s big shopping day, this is still expected to be the best Christmas for retailers since 2007. Email “Here's why 'Culchie Shopping Day' is now like any other”. Feedback on “Here's why 'Culchie Shopping Day' is now like any other”.